Lately, my Saved folder has been racking up a lot of new handbag designers that just get it. Each of their designs feels undoubtedly fresh, a tough feat in the current age of designer It bags and logomania. From the perfect polished top-handle bags to the quirky novel bags you didn't know you needed, I'm sharing eight new brands you might not have heard of yet but definitely will soon. Go ahead and stalk the following designers at your leisure. With love, from my Saved folder to yours. When a powerhouse like Net-a-Porter gets behind an up-and-coming brand in a major way, we're all ears. Gu_de's signature glossy croc-effect bags are part of the retailer's New Vanguard program, and our editor in chief, Kat Collings, gave her stamp of approval by wearing one of the brand's bags this fashion week. Surprise—more croc effect. This time it's in the form of a petite '50s-style bag that reminds me of a rare vintage treasure I once stumbled upon but (regretfully) didn't take home. Vintage-inspired but with a cool modern twist, Little Liffner is certainly one to watch. Last time I was in NYC, I walked into Opening Ceremony and was immediately drawn to an array of boxy leather totes in dreamy candy colors belonging to one Medea Sisters label. How the team was able to take a simplistic concept and make it extremely cool and cult-worthy is beyond me. I'm hooked. Wandler's got the makings of true It-bag potential. Its bags are polished and elevated with distinctive, recognizable shapes and come in so many fun color options. If you're looking for a new investment bag that's both sleek and stylish, Wandler is very good bet. The market for woven bags is pretty saturated, to say the least, but Cesta is doing things differently. Each bag is woven by artisanal cooperatives in Rwanda using only locally sourced, renewable materials, and hand finishes in NYC. It's truly a brand that empowers the women it works with, and its pretty designs are a direct reflection of that. Want to know the bag that cool girls all over NYC are wearing right now? Meet Janis Studios. Just six months old, the brand launched with its signature Darka Bag, a simple yet brilliant concept. In just two sizes and a handful of colors, the idea is that you can swap out the handles depending on mood, occasion, or season. 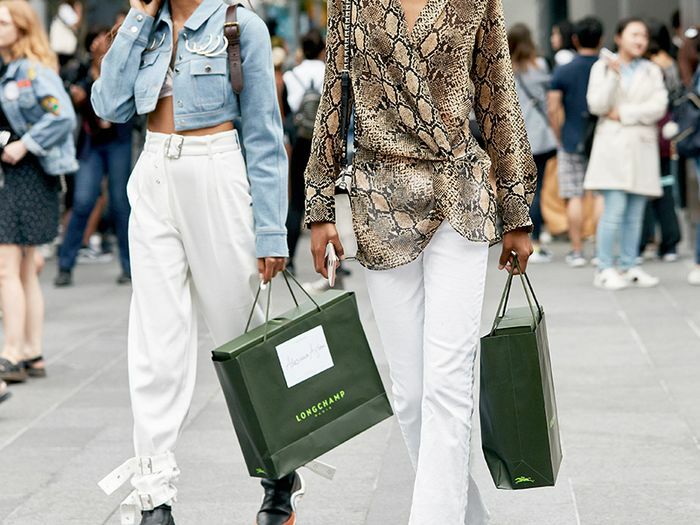 This past New York Fashion Week, Janis Studios released a new leopard-print colorway that fashion girls are about to freak over. Each of Atelier Mimii's unique quilted totes is an explosion of color, texture, and pure novelty. From lime green satin to pearl-embellished tweed, these bags are 100% fun.